Fact: Plastic checkout bags weren’t available when I was a kid, and that was fine. Good wrap-up of the plastic bag issue, here. Fact: There’s a patch of garbage hundreds of miles wide swirling in the Pacific, and another one like it the Atlantic. Both are full of plastic bags. Fact: Plastic bags damage some recycling equipment. San Jose, CA reports spending $1 million annually on repairs to equipment jammed from plastic bag contamination. Read more. 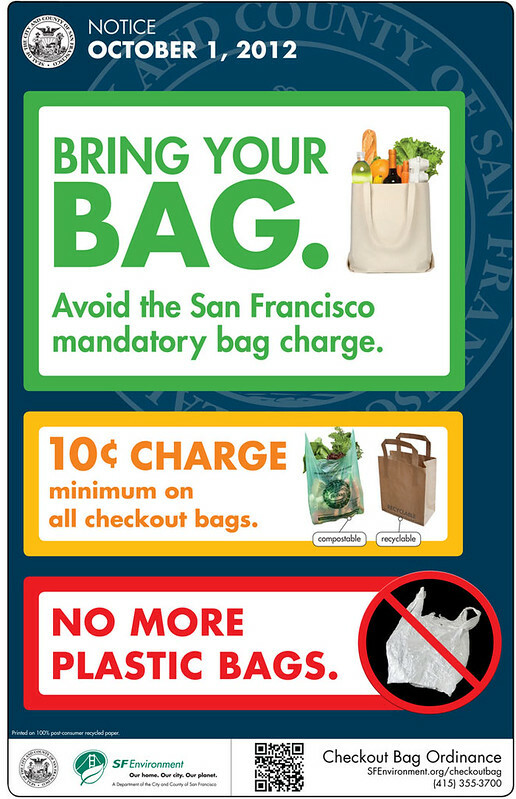 San Francisco is ready to say “good-bye” to plastic checkout bags. On October 1st, 2012, the Checkout Bag Ordinance will extend the ban on one-time use, disposable plastic bags, which currently covers large grocery store chains and pharmacies. The ban will now extend to include to all shops in the city. The ordinance will also impose a fee: the customer will have to pay at least 10 cents for any checkout bag the store provides (and those bags will now be made of paper or compostable material, only). The 10 cents goes to the shop owner, not to the city. For more information, check out the city website. Here’s another great resource on the plastic bag problem.